Want to prepare earlier for summer this year, spending time outdoors with your furkids (or actual kids)? Why not get the Flashlight Flying Discs? After all, it comes in two flavors – Frenzy and Disco, retailing for £22.95 and £29.95, respectively. Souped up with motion-activated LEDs, fiber-optics and a stonking set of vibrant colours, these light up frisbees bring this favourite British past-time to life with an array of colours, and if you think each flying disc is fun during the day – just wait until night-time! 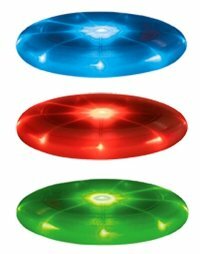 Choose between Flashlight Disc-o and its traffic light rotation of party colours or crank the madness up a notch with Flashlight Frenzy, which uses multicoloured LEDs to send the flying disc into a frenzy of colour during flight. Both flying discs are soft and comfortable to catch and throw and are ergonomically designed for optimum balance, stability and long, straight flights. No idea on how long these will last in the mouth of a boisterous pooch, but at least you know it has a long battery life which offers hours upon hours of flying time! NiteIze has these for years now.